IT TOOK 120 eggs to hold it together and four burly men to flip it, but a Sydney cafe has set a record by making the world's largest burger. 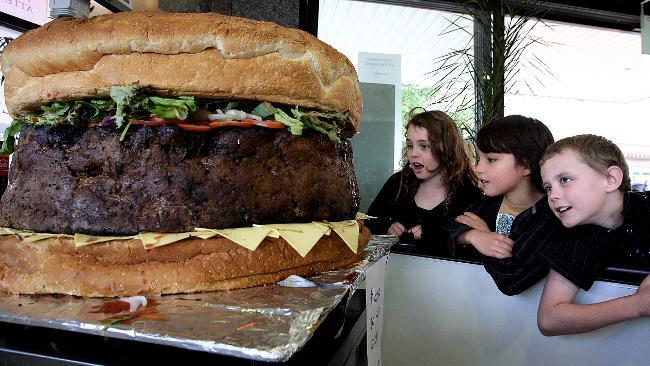 The whopping beef burger cooked up at Ambrosia On The Spot, at Randwick, tipped the scales at 95.5kg, making it the largest ever created. The previous record was held by an 84kg burger made in the US. Owner Joe El-Ajouz said the burger would not be a regular feature on the cafe's menu, considering it took him almost 24 hours to create and three months to plan, but he was delighted with the results. "I've always wanted to break a world record and this is a bit of fun and a marketing tool to get people in here and get them talking," Mr El-Ajouz said. The burger required 81kg of mince, 120 eggs, 16 tomatoes, 120 cheese slices, 2kg of lettuce, 21kg of bread and half a kilo of barbecue sauce. Mr El-Ajouz's wife Iman said the trickiest part was flipping the patty, which took 12 hours to cook through. 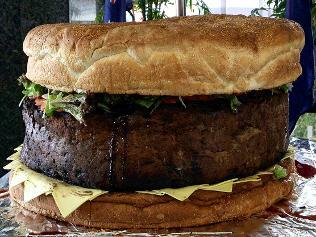 Once the meat was cooked, the burger was lovingly assembled by the cafe's staff, then put on display. Last night, it was being cut up for staff and supporters to sample.